Electronic dance music duo Galantis’s show two Fridays ago was set to start at 9 p.m., but anyone who has been to an EDM show could tell you that the headlining act wouldn’t appear until much later, around 11 p.m. in this case. So it stands as a testament to the duo’s following that the Aragon Ballroom was nearly full by 9 p.m. on this particular night. Galantis’s new album, titled The Aviary, features pop anthems that have already become party favorites. Mention Galantis and you might get a few nods, but play the first 30 seconds of standout track “Hunter” and people will be mouthing the words almost subconsciously. One can imagine this music as the soundtrack to an adventure film montage or the music blaring out of a club somewhere late at night. It is music with a very specific context, and the alluring, transporting quality of the Aragon Ballroom is transformed from medieval theme park to the fantasy land of the “seafox,” Galantis’s official mascot, an anonymous woman who wears a fluffy “fox” mask with the face of a sea creature. Following two solid headliners, the main act was finally set to appear. By now, the crowd was packed together and pushed back to the edges of the Ballroom’s standing space. Amid dramatic lighting and a sonic buildup set, Christian Karlsson and Linus Eklöw jogged onstage and hopped on top of the massive DJ booth, arms outstretched, as though they had completed a preemptive victory lap for a game they knew they would win. The varsity athlete vibe was only furthered by their matching clean, blonde haircuts and varsity jackets featuring the seafox cover art from their debut album on the backs. 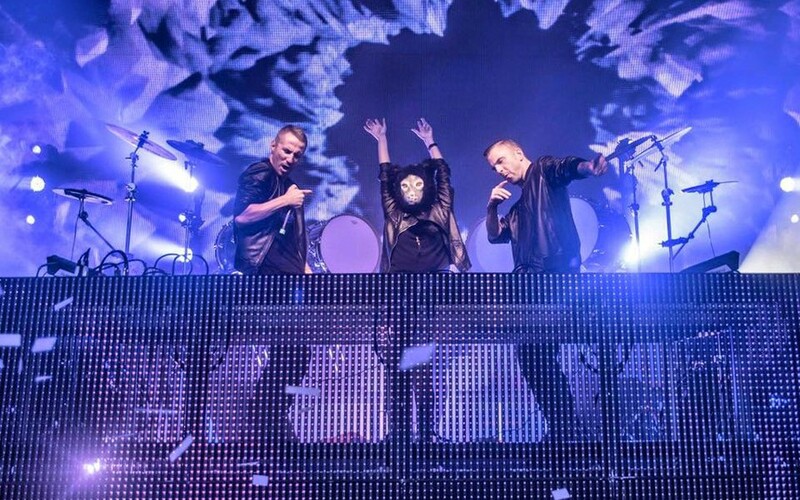 Galantis’s electronic indie pop appeals to a young crowd. However, the duo is comprised of true industry old-timers. Karlsson was first known under the stage name Bloodshy, as one half of Bloodshy & Avant. In addition to original music, the group co-wrote songs for an impressive clientele, including Britney Spears (her 2005 Grammy-winning “Toxic”), Madonna, and Katy Perry. At the same time, Karlsson joined popular indie band Miike Snow, most famous for their hit song “Animal” off their self-titled debut album. Eklöw also boasts an impressive lineup of collaborations: Usher, Kylie Minogue, Lily Allen, Zedd, and Miike Snow to name a few. With their impressive track record, it’s easy to see how the pair has become so successful. Galantis’s show was as much about the experience as it was about the music. Their visuals, in stark contrast to their opening acts, were vibrant and featured a variety of styles. Some were classic kaleidoscopic animations, while others resembled short films, featuring footage of the woman known as Seafox during their hit track “Runaway” from their first album. Another track, a remix of Whitney Houston’s “I Wanna Dance With Somebody” played to black and white clips of people dancing, sped up until they appeared frantic, mixed with cartoon clips. It felt as though someone had taken the results of a Google search for dancing videos and spliced them together to create a chaotic medley that suited the upbeat remix perfectly. Other notable visuals included simple line drawings of faces and singing mouths, set against a black background, which played during “Love on Me,” a song from their newest album that features Hook N Sling, an up and coming Australian DJ. The white lines later shifted between colors and vibrated like guitar strings, the result being similar to a flip book. The buildup was signified by intense light effects and often a complete blackout, followed by the much-anticipated and ever-present chaos of the EDM beat drop. The drop was completely expected yet exhilarating every time. Subsequent confetti cannons fired at not one, but two different times throughout the show, providing the crowd with an enchanting, snowy interlude from the hypnotic effects of the visuals. It would be easy to argue that any music that requires so much production to appeal to an audience is not really worth listening to, but this show felt as though it was much about the audience’s enjoyment as it was the artists’. And what coffee shop singer-songwriter can really make anyone dance beyond a slight sway?